This all started with Richard Polt posting on his Facit TP1 and concluding with a question about how Facit could have improved on this lovely model with the Facit TP2. Generally, the TP1 is attractive to the eye, has a nice light typing touch, yet is still very workmanlike. It's exactly the type of typewriter which a travelling journalist, for example, would have loved to carry about and use. I didn't have a TP2 at the time, so couldn't offer a comparison. But the next day I was given one, albeit one with a missing carriage lever and otherwise not working. I managed to replace a spring, adjust some rods and switches, and - almost accidentally - got my TP2 working (though not the jury rigged carriage lever, since the mechanics on this particular section of the typewriter differ completely from the TP1, from which I "borrowed" a carriage lever, to the TP2). Apart from the design changing from the rounded, smooth edges of the TP1 to a more square shape, the TP2 is significantly heavier than the TP1 - a factor, obviously, for a travelling journalist. In my opinion, the TP2 is getting up around the weight of the Olivetti Lettera 46, which is not a travelling typewriter at all - it's even heavy by semi-portable standards. The TP2 doesn't match the size of the Royal Safari, but is also getting up around that weight. Just as significantly, perhaps, the touch of the TP2, at least with the machine I have, feels much heavier than the TP1. Indeed, my particular TP2 feels very sluggish. I have now tested three TP1s, and all three type very nicely and smoothly, although I had some difficulties with the mechanics of the cream TP1, the one I labelled "inferior". I have been very interested in comments made on my recent posts on the Facits, especially those from Richard Polt, Ryan Adney, Florian, Michael Höhne and Bill MacLane. Richard Polt asked about the end-of-line lock, and, yes, as with Richard's TP1, I found this a problem with both the TP1 and TP2, and found I had to move the margin further toward the middle to overcome it on both. Another problem common to both was the ribbon reversing mechanism. 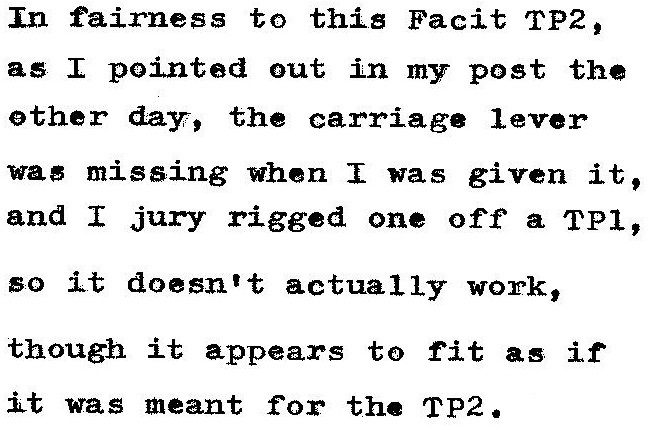 Richard also noted that the cream TP1 I posted on last Monday has no tabulator controls on either end, although it does have the tubular carriage guide. 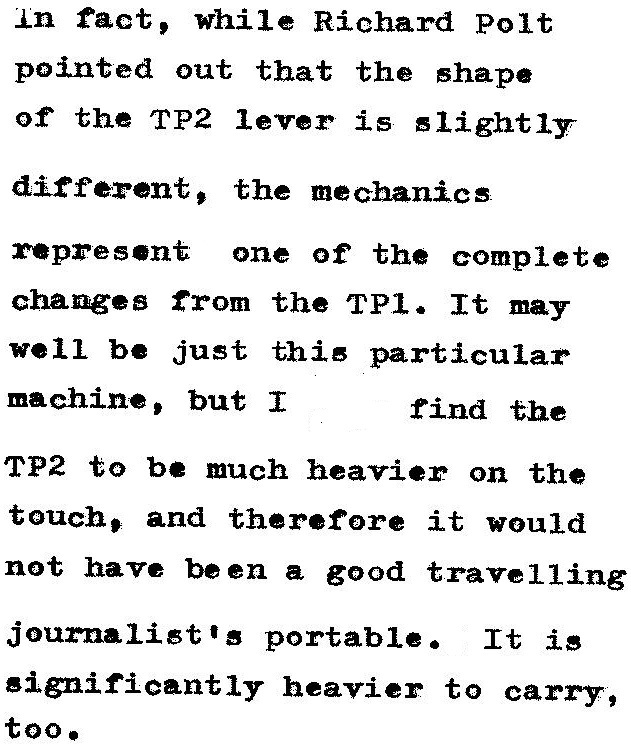 Richard wondered whether this "inferior" TP1 was an earlier model - and agreed they "do seem to be distinctly different variants". Ryan Adney commented that the "TP2 has all the look of being designed by a committee. It's clearly modelled after the TP1, but the charm and style have been rubbed out. Shame." I couldn't agree more with Ryan on this point. Florian said, "I knew that many Typospherians like the Facit TP1, but when a TP2 once showed up on a local auction site, I hesitated to bid, since it was the TP2 - seems like no one really knows about that. And I didn't realise the TP1 is that much less edgy, I think I definitely prefer the TP1 design." Again, I'm 100 per cent in accord with Florian here. Michael Höhne asked what exactly distinguishes a TP1 from a TP2. He said he liked the action and quality feel of his Facit, saying it was close to his SM8; "right up there". Sounds more like a TP1. Michael also made the astute observation that, "It seems that the TP1 and TP2 differ only in trivial ways yet they merit different designations. In this blog episode, it seems that the two TP1s differ from each other more than from the TP2." Michael asked, "is it a worry that sales are dropping off and they [Facit] need something new, so they rename the machine and move the logo to refresh the line?" And I love Michael's use of the phrase, "This sport of typarcheology ..."
Very intriguing. I wish I could get my hands on the TP2 over the Internet. 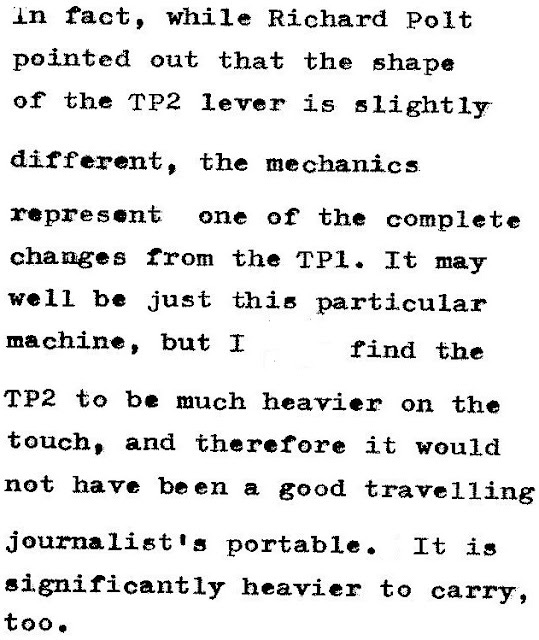 It sure seems that yours is a disappointment, but as you say, it might be that there is some peculiarity about this particular specimen, so I am curious to read more reports about TP2's. As for appearance, I do prefer the TP1 -- it's more subtle and organic -- even though that's a nice blue. Thank you for your very informative post on comparing the TP1 and TP2. I have a TP1 I like very much. It has a very good feel. I was looking for a TP2 and I am still wanting one. It will be interesting if it is as good, better or worse than my TP1. I wonder why the TP1 was never made (at least I never saw one) in blue and the TP2 typewriters I see are mostly all blue except one on Ebay a few weeks ago that was white. I missed Richard's comment on the end-of-line lock issue. I had something similar happen with mine, but I thought it was dust or age or something else. To hear that it was replicated on another machine is interesting. There is something very interesting abut this viking from the north. The interesting question is why do they "improve" a perfectly good product. The Lettera 22 is a model of perfection, for example. Yet it had to be improved, or perhaps just superseded for the sake of marketing a "new improved" version of the same thing. Looking at the fonts on your scans reminds me when we were learning handwriting in elementary school. On the locking. That was the reason I got mine for a very low price. The seller said it worked fine and then the carriage would lock. Very easy fix. Be sure the carriage locking lever stays locked down and back. I have never experienced a locking carriage since. Then with all the mechanisms in a typewriter there could be other reasons for a carriage to lock. I too missed Richard's comment on his locking. I even re-read his post. I have a TP2 with a wide carriage that I really like a lot. It sustained a little damage in shipping though, so I can't share an experience with a perfect TP2. I'm going to differ and say that the TP2 looks much more attractive than the TP1. Because I genuinely think the stark angular lines compliment the precise and unusual touch it has and that angular carriage rail. To clarify in response to some comments here: I did not mention the end-of-line lock problem I had in my post on the TP1, I just discussed it with Robert by e-mail. There were several little things that needed fixing on my TP1, but I was afraid it would be dull if I discussed them. Contact me if you want the details. The carriage lock wasn't a problem, it was the mechanism that stops you from typing when you reach the end of the line. On the TP1 it's a simple, even crude mechanism that seems susceptible to malfunction. How do you find the value price of a Facit TP1-KB model typewriter serial # P293044 from 1963?